Blizzard is understandably very happy with how well the game has preformed. We all knew Diablo III has been an amazing success for Blizzard, but now the gaming giant has revealed just how massive it has been. "We're pleased with the response to the game's launch on PlayStation 3 and Xbox 360," said Blizzard's Mike Morhaime. "Lifetime sell-through of the game across all platforms has reached over 14 million copies, and reviews have been very positive about how the game plays on console." 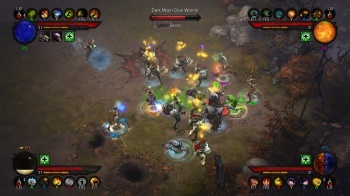 While Diablo III was the fastest selling PC game of all time, and was met with generally positive reviews, it did see some backlash from the dedicated fanbase, in particular, over the inclusion of the Real Money Auction House. However, Blizzard attributes part of the success of the console version of the game to the decision to remove the Auction House entirely. The abandonment of the auction house helped to create a "more fun and satisfying game experience" that the game's players "responded very positively to," said Morhaime. The feedback had been so overwhelmingly positive, that the company will also remove the Auction House from the PC version of the game early next year. Now, Blizzard is working on Diablo III's first expansion pack: Reaper of Souls, which is due out for the PC and PS4 in early 2014, with Xbox One, Xbox 360, and PS3 versions to presumably follow some time later.